This addition brought flowing, informal, day lit living spaces, a modern kitchen, and spacious master bath and closets to this historic gem - and provided new display space for the family's art collection. "We love the new house! We are so happy with the renovation, and are so appreciative of your great work. It really turned out amazing! " This new home was nestled into the site to take advantage of the spectacular setting. While traditional in detailing - the living spaces flow together and open out to the porch and patio. "The open first floor plan turns away from formal tradition, yet retains the warmth of coffered ceilings and Craftsman detailing. The view through the French doors from the kitchen island onto the bluestone terrace and firepit bring the outside indoors." By joining two condominiums in a South End building the clients were looking to create a home that felt spacious and modern and gave them room for to expand their family. "Anne is passionate about residential spaces, When we met with her, she seemed to immediately get our vision of clean lines, open space, and minimalist decor." 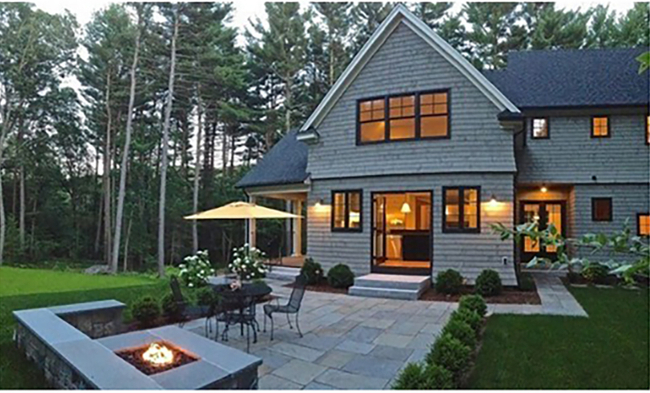 This new home in Weston MA was designed to capture the grace and charm of the shingle style era while maintaining the openness and warmth to welcome in a modern family. "The quality is apparent. From the exquisite moldings and wainscoting details to the custom built-ins....you will fall in love with the chef's kitchen, the breakfast area and the open flow into the spacious family room." Click here for link to a 3D tour of this home. This Bed and Breakfast was transformed with paint, and selective renovations to make the interior light, open and welcoming. Renovations also included a new kitchen and separate apartment for the Innkeeper. "The Inn is gorgeous, and dates back to Revolutionary times. They managed to make it comfortable for modern tastes, while keeping the charm of the old building intact." To fit into the historic Hilltop neighborhood this new home recreates a local historic house that was destroyed by fire many years ago. The inside was re-imagined as an open flowing space full of warmth and light.
" This shingle and stone home in the Hill Top neighborhood has an open floor plan with a sun-filled family room and access to outside spaces including porch, patios, and fire pit." This new home in Acton MA was designed to remember the farmhouse of the family's past in a more simple and modern re-interpretation. The South facing deck connects the living room, dining room and kitchen and is central to outdoor activities. While the overall form relates to the traditional colonials in the neighborhood - the warm exterior materials and open light filled spaces of this new home in Weston create a welcoming and informal oasis for a young family. "This stunning shingle style home offers fireplaced formal living room and lovely dining room, and an expansive kitchen. The sun-filled breakfast area with French doors leads to spectacular wrap around porch." 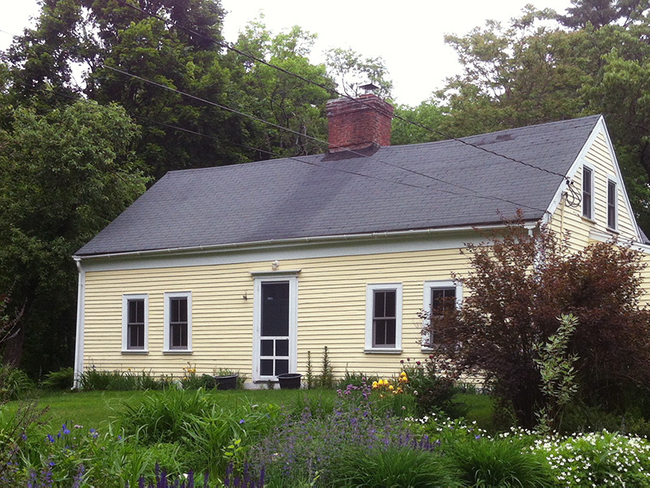 The original structure on this property is a first period (circa 1680-1700) full cape home which was built by settlers about the same time that the town of Stow Mass was established in 1683. The original hall and parlor structure was preserved intact while a new connection to the renovated barn in the rear provided additional living space. This brick house is in a beautiful location in Belmont with views of the Boston skyline but was full of dark paneling and had not been updated for at least 50 years. The renovation consisted of opening up walls in the kitchen and dining room and adding French doors. The kitchen, master suite and baths were completely redone and a new laundry room was added.